Enjoy seeing hummingbirds in your home or garden all year with this Ancient Graffiti Flamed Copper Colored Hummingbirds Decorative Hanging Chain. Each of the four, metal hummingbird figures on this chain has raised wings and a downward angled tail, creating the recognizable flight pose. A 2.25" diameter ring with a bell sits between each bird shape, and chain links connect all the pieces together for a fantastic adornment. The bells ring gently in the wind, while the mottled brown tones create the flamed copper color on the piece. A generous, top hook makes it simple to hang this adornment, and its hardy, metal construction looks equally beautiful indoors or outside. 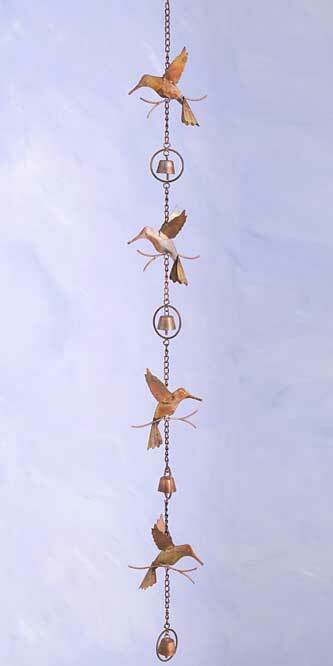 Adorn part of your living space with remarkable hummingbirds using this Flamed Copper Colored Hummingbirds and Bells Decorative Hanging Chain.